Pennsylvania state officials offer one unconvincing defense of the controversial new law after another. 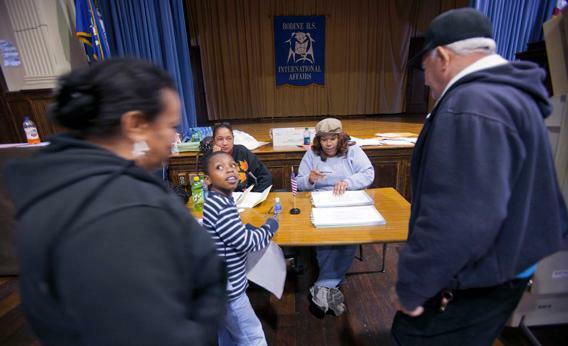 Voters show ID during the Republican primary election in Philadelphia in April. HARRISBURG, Pa.—For the last six business days, on the third floor of the shiny new Pennsylvania Judicial Center, government witnesses and attorneys have waged a daily competition. Who can give the least-convincing defense of the state’s voter ID law? Who gets to utter the killer quote that makes the petitioners’ case in Applewhite v. Pennsylvania? It should be tough to bungle. The new law, passed by state Republican legislators last year, is backed by at least 58 percent of voters. That’s after months of gut-punch headlines—“Justice Department Investigates Pennsylvania Voter ID Law,” “Why Pennsylvania’s Voter ID Law Will Create Chaos on Election Day,” and “Pennsylvania Admits There’s No In-Person Voter Fraud.” And that last headline wasn’t even true. On July 25, the start of hearings on a possible injunction against the law, a lawyer from the attorney general’s office had to explain that the state had merely decided to bracket voter-fraud stories and leave them out of the trial. Got that? The state is not trying to warm Sean Hannity’s heart with angry talk about ACORN. It’s only trying to defend how the new ID law has been implemented and to prove that it meets equal-protection standards. And the state is not quite getting there. But there’s a difference between an ID for work and an ID requirement at the polls. Easy-swipe access to the office doesn’t affect the “privileges or immunities of citizens.” Access to the vote does. The anti-ID coalition in Pennsylvania—the local NAACP, the League of Women Voters, the American Civil Liberties Union, the Public Interest Law Center of Philadelphia—has been calling witnesses who can’t get IDs for picayune reasons or witnesses who can prove the state is making people pay $13.50 for ID cards when those cards should be free. During the hearings, the lawyers not currently arguing the case sit in benches behind the counsel’s table and pass notes to ensure that nothing goes unasked. The government’s witnesses and attorneys don’t have armadas behind them. Not in the courtroom, anyway. Instead, they gamely argue the facts of the law then get trapped in logic holes, as presiding Judge Robert Simpson looks on, poker-faced. On Monday, the petitioners managed to drag David Burgess, deputy secretary for planning and service delivery, into a discussion of mismatched state voter databases. Attorney Marian Schneider got Burgess to count up all of the discrepancies, voter by voter, without context. “Today, correct,” said Burgess, agreeing to a higher possible number of disqualified voters than the state has ever contemplated. The state’s attorneys steered the ship around, getting Burgess to explain that the discrepancies were “primarily [due to] differences in the names” on various lists. But the petitioners had proven that the people who would enforce the law are still struggling with how to discuss its specifics. That story repeated itself on Tuesday when the petitioners got to quiz the secretary of the Commonwealth of Pennsylvania, Carol Aichele. Aichele was no naïf. She arrived in Harrisburg in January 2011 as a new member of Gov. Tom Corbett’s Republican administration. Her husband, Steve, became the state’s new general counsel and later Corbett’s chief of staff. She took command of the state’s voting systems. David Gersch, a Washington-based attorney who’s gotten to handle several of the most important witnesses, was able to rattle her anyway. Gersch’s strategy: Rope Aichele into a discussion of minute details of the voter ID regulations until she fell out of her comfort zone. He started with questions about some relaxed ID standards for elderly people in assisted living. “The law doesn’t restrict issue of these forms of ID,” he said, hinting at a question. “I’ve not looked at the law specifically,” said Aichele. “It was my understanding that residents of the care facilities were allowed to get these kind of IDs. “You believe that the law says …” started Gersch. “I don’t know what the law says,” said Aichele. “Well, the law says whatever the law says,” shrugged Gersch. Again and again, Gersch pushed Aichele into a back-and-forth of trivial details, which inevitably led to her admission that she didn’t know every cranny of the law. He displayed an email to curious voters from Aichele’s “special assistant” Megan Sweeney, and Aichele disputed that she actually had a special assistant. “We don’t have titles in the state government,” she said. “I think her title is, officially, executive assistant.” It isn’t. Gersch sparred with Aichele for 45-odd minutes, coaxing a few more bored-sounding answers to hypothetical questions, only once earning an objection for “hearsay.” The state only took a third as much time with Aichele, mostly to get her on record describing how the law wouldn’t cause confusion at the polls. “Do poll workers generally know how to spell your name and find it in the poll book quickly?” asked Cawley. “Do you expect that having to use your driver’s license will facilitate that process?” asked Cawley. It would, said Aichele, but the whole discussion was orthogonal to the argument the petitioners had been making. The state kept getting stuck in those kinds of discussions. Joanne Tosti-Vasey, a former state leader of the National Organization for Women, claimed that she had proved the uselessness of the law by voting with a state lobbyist ID—not a state employee ID, as the law seemed to ask for in a section about what government IDs were included in the safe list. The petitioners and Cawley fell into a lengthy discussion, with documentation, of what includes meant. “I really get the point,” said Judge Simpson. The hearing ended early. There would be no more witnesses for the state and only a few more witnesses for petitioners. I used the bonus time to meet up with a local Republican strategist who’d been following the hearings as close as everybody else and had a low opinion of them. The theory: Any decision in the Commonwealth Court would be appealed to the state Supreme Court. Why play your aces when you’ve got a higher-stakes game coming up? Why not just let the anti-ID crowd put on a parade of sad witnesses for the media? It’s a reassuring theory. If you want to save the voter ID law, you don’t want to think that Round 1 of Applewhite v. Pennsylvania is the best you can do.